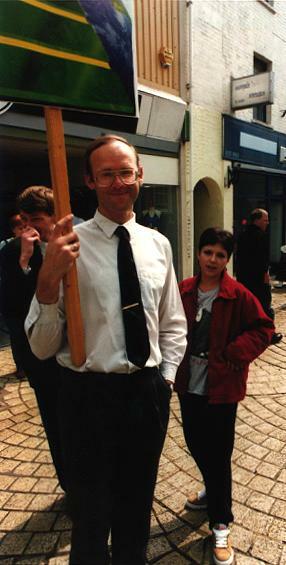 An unannouced picket against the $cientology org in Poole. Since the org is not where the body-routing is done, we converged on the little square on the high street where the body-routers congregate. We were - unfortunately - without picket signs, but made of fir this by having Xemu in costume and balloons! Roland in the background wearing the excellent Xemu costume. 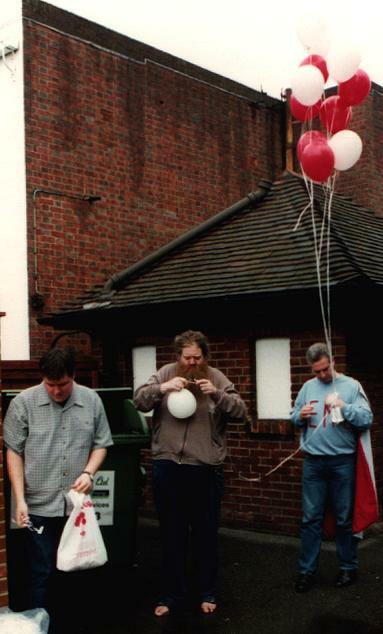 Dave mounting a string on yet another balloon, and an anonymous newcomer shuffling uninflated balloons about. The long strings holding the balloons did create some problems, in that the strings got all tangled up, and the balloons were difficult to hand out at the rate they were requested.. The balloons featured the words "Xemu loves you" and a great piece of ASCII art by Dave. The cards attached to the end of the string had a brief discussion of Xemu on one side (ending with the sentiment "Blow up balloons, not volcanos!") and a mentioning of "the clam" on the other side. Ready for any unsuspecting member of the general public. The light blue leaflets sported by Martin and the anonymous protester were my own humble contribution (words here). Duke the dog must have been temporarily occupied somewhere else. 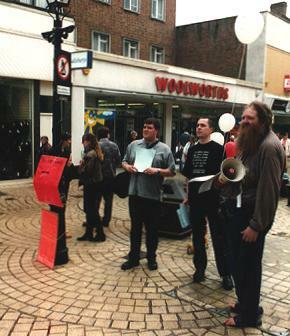 The person in the center wearing a red jacket had just thrown away the leaflets of the anonymous protester on the right. No doubt, this is what "free speech" means to $cientologists - you can say anything they like and they'll tear up your leaflets if you say anything else. Before this, she had apparently thrown away Martin's leaflets. 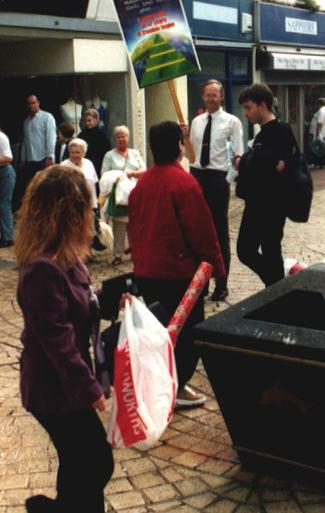 The woman in the foregound is a passer-by, no doubt wondering what on earth is going on.